TSplus is the fast, simple and affordable way to instantly deliver existing Windows applications to users anywhere. In a snap, TSplus will enhance your Windows system: Web Portal, HTML5 and RemoteApp client, Seamless application publishing, Universal Printer, Load balancing, Failover, Application Control and much more benefits are provided into this all-in-one solution. Based on a unique HTML5 technology, TSplus Mobile Web is the reliable, scalable and cost effective solution to web enable any Windows application. TSplus will help you to build web solutions providing the easiest-to-use solution to web enable any Windows application. TSplus is installed in few minutes and it does not ask for any complex configuration nor technical knowledge. AdminTool, TSplus' intuitive management tool, offers full A-to-Z administration functionality to get your Web Application Portal going in no time. It oversees the full range of TSplus features in minutes with easy, hands-on control and tight security. 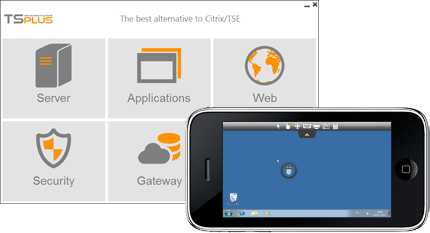 With HTML5, Mobile users can start applications or a Remote Desktop session from any device (iPhone, IPAD, Galaxy, MAC...). Time zone redirection is now supported: Wherever your server is hosted, your Remote Session will re-direct your local PC's time. This enhancement is important for our clients located in large countries such as USA, Brazil, China, Russia, and also for all Cloud Computing hosted server.